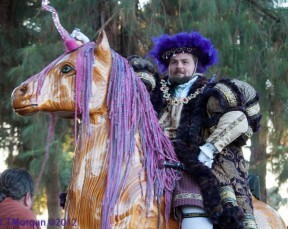 Kearney Renaissance Faire: A Weekend Full of Feasting, Merrymaking, and Fun for Everyone! It isn’t Brigadoon, but it’s close. Springing up from the autumn mists for only one weekend will be an English village celebrating its harvest, including jousters, soldiers, merchants, entertainers and the visiting King Henry VIII and his court. They will arrive in Fresno’s Kearney Park November 9 and 10 for the 16th Annual Kearney Renaissance Festival, a benefit for the food pantry at Catholic Charities. Held each year in the beautiful and expansive fields of Kearney Park, this annual Renaissance event is the finale of the local faire season. Its late-in-the-year date makes it a perfect opportunity to celebrate autumn and begin your holiday shopping. The Kearney Faire features a terrific variety of sights and sounds, attractions, shopping, eating, education and entertainments. The smells of the food court are often the first thing to attract patrons at a faire, and at Kearney Park it is no different. With the cooler weather, however, crowd favorites like funnel cake and roast beef sandwiches really hit the spot, as does a glass of ale. And there are the more historical foods to try, too…meat pies and turkey legs, for instance. Right after surveying the food options, check out the schedule for the performances at the stages where favorite acts such as Out of Kontrol (a blend of comedy-juggling-and stunts) and Myth and Magic (comedy-storytelling- and magic) take the stage. 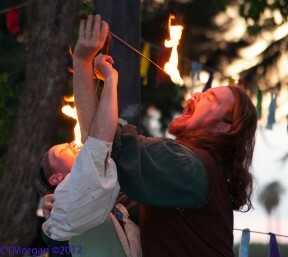 In fact, one of the most popular shows is a Kearney Faire Only specialty: The Medieval Madness show is a once-a-year combined performance of these two acts (and sometimes with more guest performers joining them) for a hysterically daring outing. In fact, it is pretty rare to have so many large-scale attractions in one event. Typically, having enough space in a park prevents faires from booking too many large activities. “Kearney Faire is the only event in the area with a 20 foot tall trebuchet. 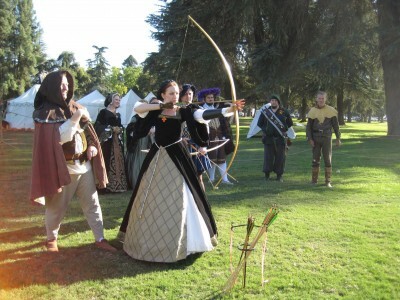 Because we have so much room we can accommodate the joust, the long-range arrows of a full archery field and a massive battle re-enactment,” Roberts explains. 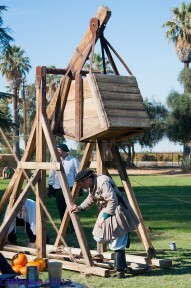 The trebuchet, a counter-weight siege engine from the Middle Ages, is fully functional and typically throws full-sized pumpkins across a field throughout the day at faire. Also on-site, several cannons are routinely fired for demonstration and are featured in the battle re-enactment. 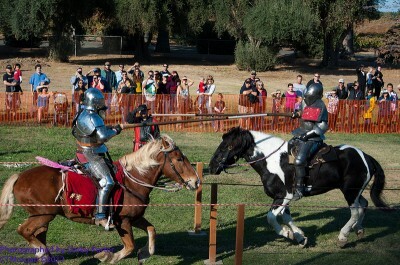 The joust is also a full-contact tournament and is one of the most popular attractions, typically scheduled for midday. Even if dressing up and playing with the actors isn’t for you, Renaissance re-enactors encourage patrons to ask questions, to watch them as they perform a moment in history, or observe how they talk and wear their clothes. The clothes of many of the actors are very historically accurate and they are open to answering any questions you may have about them. Also the Royal Court of King Henry VIII encourages visitors. There you might be able to learn a courtly dance and speak to the King himself! Many patrons have told Roberts how impressed they are that the re-enactors are very prepared with their knowledge of history. 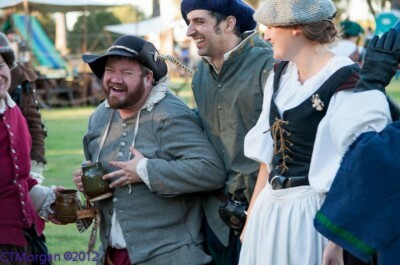 The re-enactors also like to see people dress up in period costume and get involved. The entry fee at the front gate of Kearney Park includes both your park fee and your admission fee to the faire. This year, they take credit cards at the gate (via a Square card-reader at the front gate) and there is an ATM on site if you need cash for a particular purchase. Admission is $1 off with the donation of canned food. 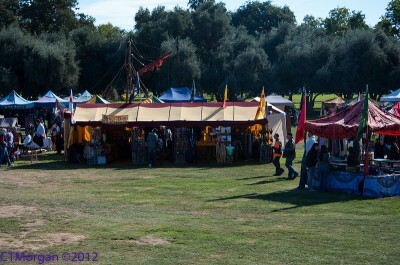 The faire takes place in the Garfield Corners area of the park, which is in the south-west side of the park. There is one handicapped lot and three other lots for parking in that area. Pets are not allowed in the park grounds unless they are a service animal; service animals must be wearing their identifying jackets. Cannons will be fired throughout the day, so if you are sensitive to noise, be aware. And bring an umbrella and wear warm shoes! The event is rain or shine, but even when it rains it is usually brief showers and the faire continues when they pass by! Saturday, November 9 and Sunday, November 10, 2013. 10 a.m. until dusk. Admission: $10 adult. $8 Senior, Military and Students. $1 off with the donation of canned goods. Location: Kearney Park, Fresno. 7160 W Kearney Blvd., Fresno. Highway 99 to Highway 180 West. Left on Hayes. Right on Kearney Blvd. Heather Parish is the Artistic Director of The New Ensemble Theater Group in Fresno.